RELIEVE ATHLETE’S FOOT AND RINGWORM WITH ONE SINGLE MEDICATION THAT REPLACES FOUR SEPARATE PRODUCTS! 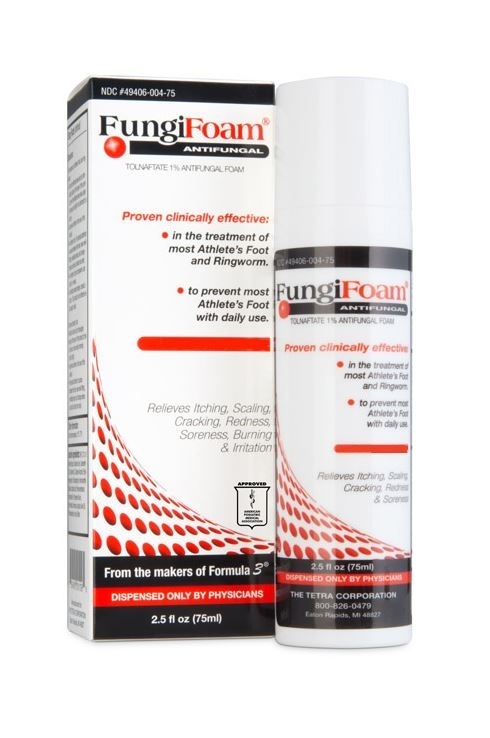 Only FungiFoam® Antifungal successfully treats and prevents Athlete’s Foot and Ringworm while providing the benefits of four other products. What’s more, FungiFoam® works in days — not weeks or months! Unlike other topicals that may prove ineffective, the secret to thick, creamy FungiFoam® is its combination of oil-soluble tolnaftate in jojoba oil, allowing the medicine to quickly penetrate the skin and put the power of four products to work immediately. Antifungal for Penetrating Healing. FungiFoam® delivers oil-soluble tolnaftate in natural jojoba oil. The jojoba oil is in-solution and is quickly absorbed by the skin which delivers the tolnaftate directly to the infected area, where it begins healing right away. Anti-pruritic for Calming Itchy skin. Within minutes after application, patients report relief from the itching brought on by fungal infections. Moisturizers for Softening Skin. FungiFoam® restores the skin’s natural properties and is formulated for everyday use. One container of FungiFoam® will provide treatment and relief for up to six months. Exfoliants for Smoothing Skin. FungiFoam® sloughs off unsightly scaling, flaking, and cracking skin, leaving behind skin that’s smooth, attractive, and leaves no greasy residue. No longer will you have to spend a fortune on multiple products that don’t prove effective. Contact one of of our staff members at Coastal Foot Care Services, Inc. to find out more about FungiFoam®!